This flower pot costume came entirely from the dollar store. Whip up a wizard’s robe for your Harry Potter-obsessed little one with a T-shirt in just 15 minutes. A TMNT shell requires just spray-painting a roasting pan. This Medusa headband consists of gluing plastic snakes to a headband and spray-painting it gold. Channel Frida with fake dollar-store flowers and an eyebrow pencil. This Hulk Hogan costume consists of simple clothing pieces you can find at any thrift store. For a little added Halloween festivity, thread spider rings onto a little girl’s pigtails. Already got an all-white ensemble? Use black tape to be a stick figure. Or paint lines onto your all-white outfit for a college-ruled costume. Cut up carpeting to make a Viking costume. Crumple up some kraft paper to make a snail shell. This elaborate-seeming Kool-Aid Man costume consists of a hula hoop, bed foam, and felt. Cut up a cheap umbrella to create bat wings. Make Minion glasses with protective goggles from the dollar store and canning jar rings. Add some thrifted overalls to finish the look. Or wrap a pair of oversize glasses with aluminum foil and wear a yellow hoodie. Glue some realistic-looking bugs to a pair of nylons and you’ve got the easiest costume ever. A delicious-looking EasyMac costume can be made from spray-painted toilet paper rolls. how she made this here. If you’ve got a big gang to dress, make everyone wear black and glue white dots to their outfits. Get punny and be an identity thief. You probably have a rubber chicken lying around, so why not be chicken cord-on-bleu? Stay comfy and warm with a Three Blind Mice sweatsuit costume. If you’ve already got a glamorous all-black wardrobe, become a glam skeleton with just a little face paint. Are you a parent who posts way too many photos of your baby on Facebook? Literally tie up your button-up shirt, add a bandana, and pair with the high-waisted jeans you (probably) already own. The bandana (paired with very pretty ’50s makeup) can also turn you into Lucille Ball. Got a lip palette, lip brush, and black eyeliner? Turn yourself into a mermaid by applying makeup over a fishnet stocking. Need a costume that requires custom colored boots or shoes? Or colored legs for that matter? “Crazy cat lady” is the coziest and warmest of all costumes. Be a cupcake cutie with simple supplies from the craft store. A cardboard box and Tupperware make a great parent’s costume. Don’t want to bother with a real costume? Make an easy cobweb tiara with wire and a headband. 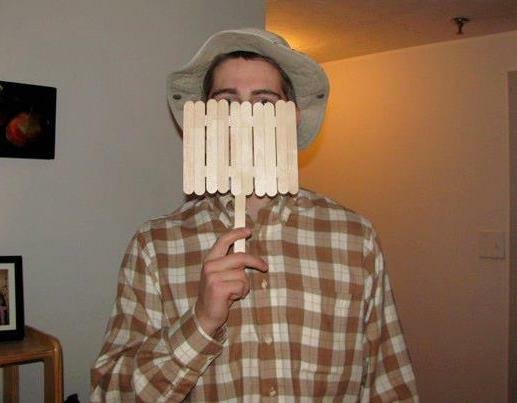 Popsicle sticks and a fisherman’s hat = instant Wilson. Or if you’d prefer a fancy spiderweb fascinator…. Live in a cold climate? Transform an old pair of gloves into monster claws. Make your own Wyldstyle costume using colored tape on a black hoodie and hair chalk. You can (and should) wear this T-shirt all year round. This costume is so easy, a child could make it. Use fake foliage to sprout a chia head. Draw on white stockings to channel Sally from Nightmare Before Christmas. This spectacular cape is completely no-sew. As is this colorful strawberry costume. And finally…for groups of friends who still won’t stop quoting Mean Girls. Hi there, You’ve performed an incredible job. I will definitely digg it and in my view suggest to my friends. I’m confident they will be benefited from this site. price of viagra in rupees. I just want to tell you that I am just new to blogging and truly enjoyed you’re page. Most likely I’m likely to bookmark your blog . You definitely come with terrific article content. Thank you for revealing your blog site. hello!,I really like your writing so so much! proportion we be in contact more approximately your post on AOL? I require an expert on this space to resolve my problem. May be that’s you! Looking ahead to see you.